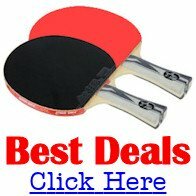 So you've started a new table tennis club and now you need to know how to set out the tables. But which table layout is best? Does it matter how the tables are set out? What are the ideal layouts for different sized clubs? So let's take a look at some ideal table layouts for different sized clubs. Some clubs may not be able to provide more than one table, so the table layout will not be an issue for them. But what if you do have more space available - what table layout should you use? Well, there are an infinite number of ways that you can arrange the tables inside your club but the starting point is to determine what size the playing areas should be. The recommended size of an individual court for one table tennis table varies according to the standard of competition being played. 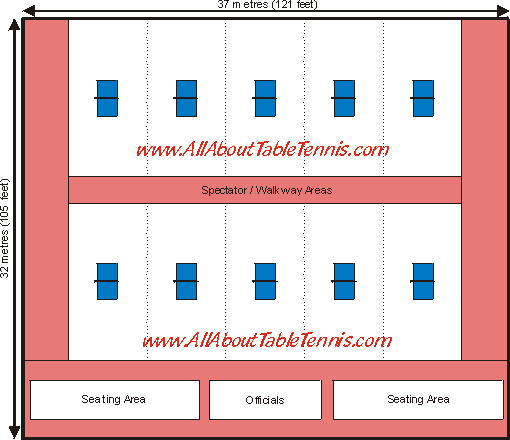 (I've set out the various dimensions for table tennis room sizes here. You'll also find details about recommended lighting levels, wall colours, flooring and room temperatures too). However, 10m x 5m (33 feet x 17 feet) is a good standard court size to use for a club. Although a smaller playing area could be used, it would not be ideal for players who are more advanced than beginners. If you're starting a table tennis club and you only have very basic facilities - for example if you're in a developing country or in a deprived area - you can still get started. Then just play table tennis and enjoy it. You can make up your own rules or follow the official rules. You should never let a lack of facilities stop you from playing this fantastic sport. Most clubs will be able to have more than one table, so let's take a look at some ideal layouts for clubs that can accommodate more than one table. Whatever the size of your club and however many tables you have, the ideal layout is for the tables to be side by side because this will help to eliminate unnecessary background distractions. 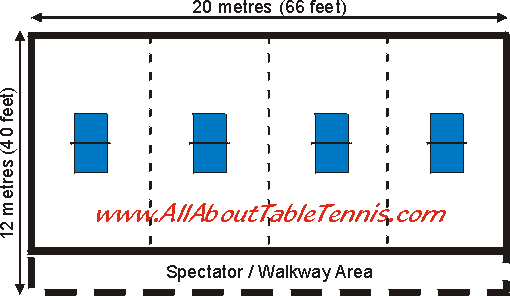 The size of an individual court for one table tennis table varies according to the standard of competition being played. However, a good standard court size to use for a club is 10m x 5m (33 feet x 17 feet). Although a smaller playing area could be used, it would not be ideal for players who are more advanced than beginners. A small club would typically have four tables. So what size of venue will you need to accommodate four tables? Well, to have enough space for four courts at 10m x 5m (33ft x 17ft) you'll need a minimum area of approximately 20m x 12m (66ft x 40ft). Barriers should be placed between the courts to limit the number of balls straying out of each court. Also, the clear height required over the playing area is 3 metres (10 feet). You'll also require a 2 metre (7 feet) wide area for use by spectators and as a walkway for the players so that they can access all the tables without walking through the playing area. In addition, you may also need to provide additional areas for changing facilities, toilet facilities, refreshment facilities and seating. If you decide that you want to start a larger club, then the number of tables you can have will only be limited by the size of the venue. Each court should measure approximately 10m x 5m (33ft x 17ft) and the clear height required over the playing area is 3 metres (10 feet). Barriers should be placed between the courts to limit the number of balls straying out of each court. You'll also require an approximately 2 metre (7 feet) wide area along the whole length and 1 metre (3 feet) wide area between the groups of tables for use by spectators and as a walkway for the players so that they can access all the tables without walking through the playing area. 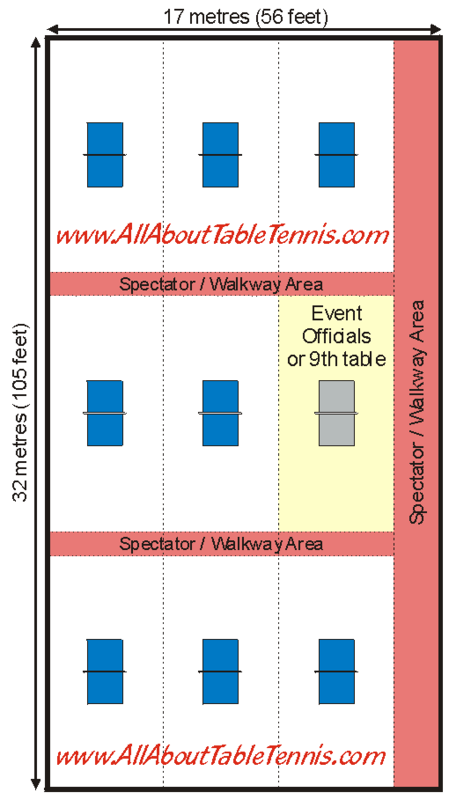 The area shown above for the ninth table could be used for the event organisers when a competition is being held, or just as a regular court at other times. If you have a larger venue you can allocate more room to each court and this will be better for more advanced players and/or for running a tournament or other competition. As this could be used for a competition / tournament, each court will be slightly larger than the previous examples and should measure approximately 12m x 6m (39ft x 20ft). The clear height required over the playing area will be 4 metres (13 feet) and barriers should be placed between the courts to limit the number of balls straying out of each court. You'll also require an approximately 3.5 metre (11 feet) wide area along the whole length and a 6 metre (20 feet) wide area for use by spectators and officials. If you are fortunate enough to have a very large venue, the possibilities are endless. After you've decided to start a table tennis club, and you've decided on your table layout, there'll also be a whole range of other tasks that you'll need to organise, depending on the size of your club. For small clubs, it's usually preferable if one or two people take control and organise everything. But for larger clubs, or as soon as a small club begins to expand, additional people will be required to run the club successfully. But remember, the idea is to HAVE FUN, so don't let a lack of space stop you from playing. Just adapt to what's available.